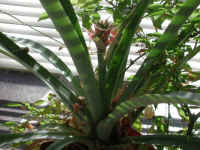 (Growing a Pineapple from a Cutting - 01) Several years ago, we decided to see if we could grow a pineapple as a potted plant within our home. So, when we purchased a pineapple with a nice green leafy top, we cut it off and placed it in a pot with potting soil, and kept it moist and out of the direct sunlight. 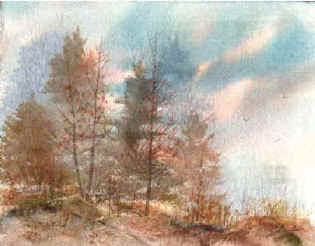 Of the several that we tried, we had two that took root and grew. 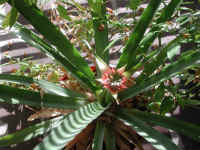 (Growing a Pineapple from a Cutting - 01a) Then, a few years later, one of the pineapple plants began to sprout a new pineapple. We were delighted, but unfortunately so were the mealy bugs. We try to keep the mealy bugs under control by washing them off with water in a spray bottle mixed with a little mild detergent, and by cleaning the sticky stuff off with a cotton tipped applicator dipped in a little rubbing alcohol. (Growing a Pineapple from a Cutting - 02) This is another view of the baby pineapple sprout. We have this pineapple growing in a pot on the floor in front of our sliding glass patio door on the sunny side of our home. (Growing a Pineapple from a Cutting - 02a) This is a closer look at the baby sprouting pineapple. 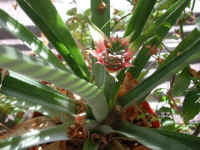 (Growing a Pineapple from a Cutting - 03) This is another look at our pineapple plant with its new sprouting baby. (Growing a Pineapple from a Cutting - 03a) This is a closer side view look at the sprouting baby pineapple. 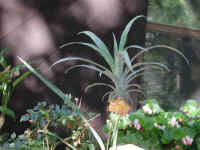 (Growing a Pineapple from a Cutting - 04) This is another look at our pineapple plant silhouetted against the sliding glass door. Every day with our Foundation work, we face some of the most horrendous atrocities committed upon animals; and growing this pineapple and sharing the beauty of God's creation with others helps bring some peace to our heart and soul. 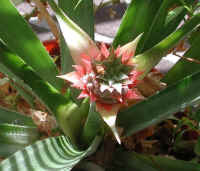 (Growing a Pineapple from a Cutting - 05) The baby pineapple continued to grow, and then a few days later, we were happily surprised to see that it had sprouted some beautiful flowers. 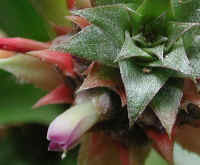 (Growing a Pineapple from a Cutting - 05a) In this photo, we have a closer look at some of the pineapple flowers. 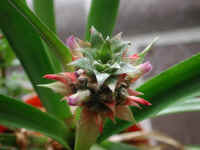 (Growing a Pineapple from a Cutting - 06) This is another look at the blooming pineapple. 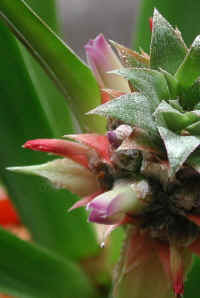 (Growing a Pineapple from a Cutting - 06a) This is another close up look at a pineapple flower and a sprouting bud. 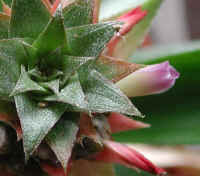 (Growing a Pineapple from a Cutting - 07) This is a top view of the blooming pineapple. (Growing a Pineapple from a Cutting - 07a) This is a closer look at one of the pineapple flowers. (Growing a Pineapple from a Cutting - 07b) This is a closer look at another one of the pineapple flowers. 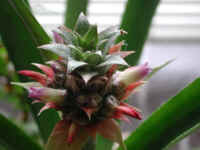 (Growing a Pineapple from a Cutting - 07c) This is a closer look at a third pineapple flower. 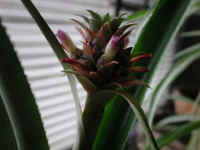 (Growing a Pineapple from a Cutting - 08) This is a side view of the flowering pineapple. 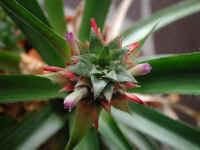 (Growing a Pineapple from a Cutting - 08a) This is a closer side view look at the flowering pineapple. 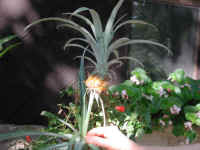 (Growing a Pineapple from a Cutting - 09) When the weather was warm, we took the pineapple plant out onto our porch deck. 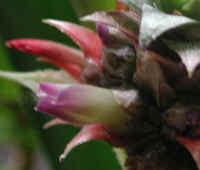 but the weight of the pineapple with it's large sprout of green leaves bent the stem down. 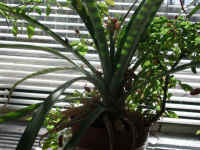 The green top on the baby pineapple is almost as large as the parent plant, and much more robust. 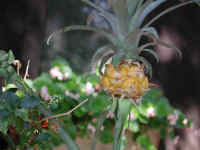 (Growing a Pineapple from a Cutting - 09a) This is a closer look at the now fully ripe, but small baby pineapple. 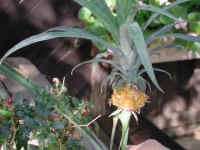 (Growing a Pineapple from a Cutting - 10) This is another look at the small mature baby pineapple. 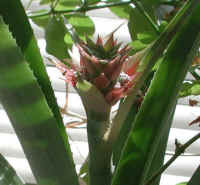 (Growing a Pineapple from a Cutting - 10a) This is another closer look at the baby pineapple. 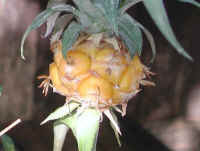 (Growing a Pineapple from a Cutting - 11) This is another photo of the small ripe pineapple fruit. 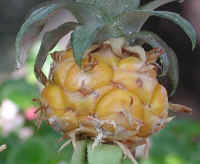 (Growing a Pineapple from a Cutting - 11a) This is a close up look at the fully ripened baby pineapple fruit. 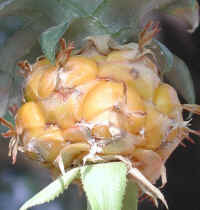 The dried up remains of the flowers can be seen at the end of each of the "nodes" on the fruit. This is the color that a fully ripened pineapple should be, but unfortunately they cannot let them fully ripen and ship them to markets for sale. 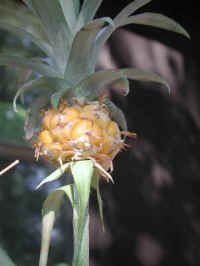 (Growing a Pineapple from a Cutting - 12) This is another look at the ripe baby pineapple. 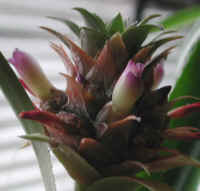 (Growing a Pineapple from a Cutting - 12a) This is another close up look at the fully ripened baby pineapple. 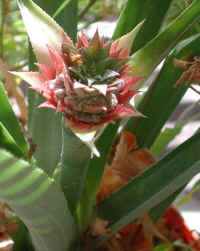 (Growing a Pineapple from a Cutting - 13) This is another view of the pineapple fruit. (Growing a Pineapple from a Cutting - 13a) This was the final photo we took before picking and eating the fruit. If we had waited any longer it would have spoiled. It was the sweetest pineapple we had ever eaten. 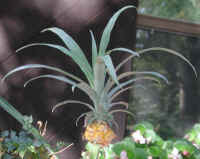 It had been a real joy to grow our own pineapple from a cutting and watch it grow and produce fruit. We look forward to more.